Old Amish recipes for easy Amish cooking. These Amish food recipes are old, authentic and easy to make whether you are homesteading or not. Bake, Preserve and Cook your way into an Amish kitchen. 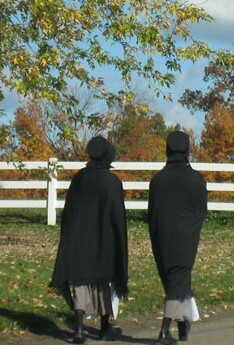 The Amish, also known as the plain people, have shunned most of modern technology for more simple lifestyle. The Pennsylvania Dutch are a hard working people and an Amish saying is, "Them that works hard, eats hearty." Amish recipes are a blend of dishes from their many homelands and the ingredients grown in their newly adopted country which produced tasty dishes that have been handed down from mother to daughter for generations. The Amish friendship bread starter recipe is a recipe that is peculiar to this culture, and one of the many Amish recipes found here that are authentic. If you have an recipe of your own that you would like to share, please do so in the box below. And if you could upload a picture of the final product that would be great! One of the many folk tales traces this custom back to the burnt offerings made by their old country ancestors to the goddess of spring. With the coming of Christianity the custom became associated with the Easter season and 'fastnachts'are eaten on Shrove Tuesday to ensure living to next Shrove Tuesday. The Amish eat dandelions because they recognize the benefits of dandelion. 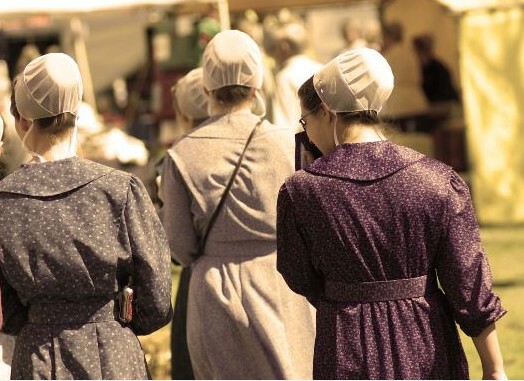 Amish cooking was truly an art requiring much intuitive knowledge, for Amish recipes contained measurements such as 'flour to stiffen,' 'butter the size of a walnut,' and 'large as an apple.' Many of these Amish recipes have been made more exact and standardized providing us with a regional cookery we can all enjoy. Soups are a traditional part of Amish cooking and the Pennsylvania Dutch housewife can apparently make soup recipes out of anything. If she has only milk and flour she can still make rivel soup. 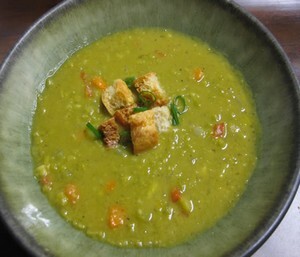 However, most of their soups are sturdier dishes, hearty enough to serve as the major portion of the evening meal. 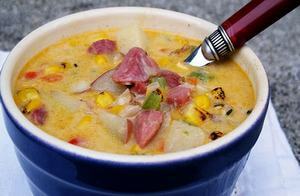 One of the favorite summer soups in the Pennsylvania Dutch country is Chicken Corn Soup. Few Sunday School picnic suppers would be considered complete without gallons of this hearty soup. The Christmas season is one of the busiest times in the Pennsylvania Dutch kitchen, where the cookbooks are thrown open and Amish recipes start flying. For weeks before Christmas the house is filled with the smell of almond cookies, anise cookies, sandtarts, Belsnickle Christmas cookies, walnut kisses, pfeffernusse, and other traditional cookies. Not just a few of one kind but dozens and dozens of many kinds of cookies must be made. There must be plenty for the enjoyment of the family and many holiday visitors. Regardless of the time of the year or the time of the day there are pies. The Pennsylvania Dutch eat pies for breakfast. They eat pies for lunch. They eat pies for dinner and they eat pies for midnight snacks. Pies are made with a great variety of ingredients from the apple pie we all know to the rivel pie which is made from flour, sugar, and butter. The Dutch housewife is as generous with her pies as she is with all her cooking, baking six or eight at a time not one and two. The apple is an important Pennsylvania Dutch food and found in many Amish recipes. Dried apples form the basis for many typical dishes. Each fall barrels of apples are converted into cider. Apple butter is one of the Pennsylvania Dutch foods which has found national acceptance. The making of apple butter is an all-day affair and has the air of a holiday to it. In the past, early in the morning the neighbors used to gather and begin to peel huge piles of apples that will be needed. Soon the great copper apple butter kettle would be brought out and set up over a wood fire. Apple butter requires constant stirring to prevent burning. However, stirring can be light work for a boy and a girl when they're young and the day is bright and the world is full of promise. By dusk the apple butter is made, neighborhood news is brought up to date and hunger has been driven that much further away for the coming winter. Combine in the order given, stirring after each addition. Boil until thick. Cool before adding to the salad. Wash dandelions and pick over carefully. Roll in cloth and pat dry. Put into a salad bowl and set in warm place. Cut bacon in small cubes, fry quickly and pour over dandelions. Put butter and cream into a skillet and melt over low heat. Beat eggs, add salt, pepper, sugar and vinegar, then mix with the slightly warm cream mixture. Cook over high heat until dressing is quite thick. Pour, very hot, over the dandelions, stir well and serve. Beat cream, sugar, vinegar and salt together thoroughly until the dressing is like whipped cream. Discard outer leaves of cabbage. Shred the rest finely and combine with dressing just before it is ready to serve. Serves six. As variation: Add shredded green and red peppers. Mix mustard, salt, sugar, flour, paprika and pepper. Add egg and mix thoroughly. Add milk and vinegar. Cook over hot water, stirring frequently until thick. Add butter. Cook and stir until melted. Pare and thinly slice cucumber and onion sprinkle with a teaspoon of salt and let stand for a few minutes. Pat with towel or absorbent paper to take out all moisture possible. 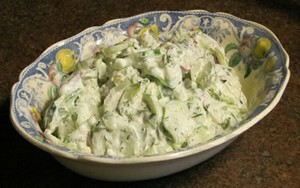 Place cucumbers and onions in serving dish, add the vinegar and mix. Pour on enough sour cream to half cover and dust with pepper. Chill. Chop up bacon and fry until crisp. Mix together mayonnaise, sugar, vinegar, bacon and raisins. Pour over broccoli and onions. Mix well. Let stand for an hour or more before serving. Add milk to flour slowly, stirring constantly to keep mixture smooth. Add 1 egg at a time, beating well after each addition. Salt and mix well. When cooking in boiling salted water or meat broth, pour the batter from a shallow bowl, tilting it over the boiling kettle. With a sharp knife slice off pieces of the batter into the boiling liquid. Dip knife in the liquid before each cut to prevent sticking. Dice the bacon and put into pan to brown, add onion, celery and pepper; fry until bacon is crisp. Add the corn and fry together for 3 minutes. Add the potatoes, tomatoes and seasoning, cover and simmer for 30 minutes. Finally add the milk, heat to the boiling point and serve with a little chopped parsley. Soak beans in water overnight. Drain, add fresh water and cook slowly with the ham bone for 2 hours. Put in the onion, celery, potatoes, tomato sauce, parsley and the salt and pepper and simmer until vegetables are soft. Remove the ham bone, trim off any meat, cut it up and add to soup. Many Pennsylvania Dutch cooks cut up hard boiled eggs and add them to the soup. Boil potatoes and onion in small amount of water until soft. Add milk, salt and pepper then reheat. Brown flour in the butter and blend it slowly into the potato mixture. Add a little water to the beaten egg and stir into the soup. Let it cook for a few minutes and serve with a sprinkling of chopped parsley. Put cut-up chicken and onion into the water and cook slowly until tender, add salt. Remove chicken, cut the meat into small (1-inch) pieces and return to broth, together with corn, which has been cut from the cob, celery and seasoning. Continue to simmer. Make rivels by combining 1 cup flour, a pinch of salt, 1 egg and a little milk. Mix well with fork or fingers to form small crumbs. Drop these into the soup, also the chopped, hard-boiled eggs. Boil for 15 minutes longer. Cook corn in water for 10 minutes. Make a batter by mixing egg, flour and milk together. Pour this batter through a colander, letting it drop into the boiling corn. Add butter and salt. Cook slowly in a covered pan for 3 minutes. Garnish with chopped parsley. 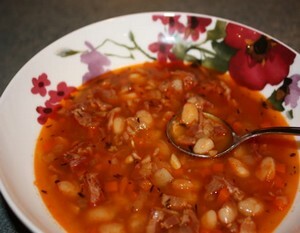 Soup should be eaten immediately after rivels are cooked. Bring to boil again and add noodles, preferably home made noodles. Cook for 20 minutes longer. Combine meat, salt, pepper, rice and egg, mix well. For the sauce: fry onion in the butter until soft. Add tomato soup and equal amount of water to onion, also celery, parsley, lemon juice, sugar, salt and pepper. Cook for 10 minutes. Wash the cabbage leaves and boil until tender. Put equal amounts of the meat mixture into cabbage leaves, roll tightly and secure with toothpicks. Place rolls in sauce pan, pour sauce over them, cover pan and cook very slowly for 3 hours. Prepare a young duck for roasting. 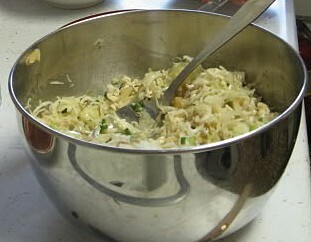 Place in a roasting pan and add 2 quarts of sauerkraut, 1 cup of water and 3 tablespoons granulated sugar. Cover and bake until duck is tender and golden brown. Serve with creamy mashed potatoes. Boil the pork chops in water for ½ hour. Then add the potatoes cut in half and the sausage cut in 1 inch pieces. Cook until potatoes are almost done. Drop well-beaten dumpling dough into the boiling meat mixture, cover and cook 10 minutes. 2 inch thick piece of chuck, pot roast or tender boiling beef. Place in dish or bowl and cover with solution of half vinegar and half water, put in two large onions sliced. Do this two or three days before the meat is wanted. On the day before it is to be cooked cut 3 or 4 slices of bacon into 1" pieces and chop fine 1 tablespoon of the onion which has been soaking in the vinegar. Cut holes in the meat 1 or 2 inches apart and stuff bits of the bacon and chopped onion into the holes. Put the meat back into the solution, add 1 tablespoon whole cloves and 1 teaspoon whole allspice. Bake the meat as a pot roast in part of the solution, until tender. Use more of the solution, adding sugar to taste, in making the gravy which will be almost black. Melt butter, remove from heat and stir in flour. Add the milk gradually, stirring constantly, until mixture boils and thickens. Add salt and pepper and cook for 3 minutes more. Add the grated horseradish and dry mustard and blend well. Keep hot in double boiler. Serve on slices of boiled beef or corned beef. Dredge meat with flour and season. Melt shortening (preferably bacon fat) and brown the meat in it. Remove meat from the pan, stir in the flour and blend. Add the tomato juice and stir well until mixture thickens. Add meat, carrots and onion. Cover closely and simmer for 45 minutes. Mix the above ingredients, roll out and cut in two inch squares. Flour chicken and fry in butter. Put layers of chicken, potato slices, sliced onion and squares of pot-pie dough. Barely cover with boiling water and cook for two hours. Roll chicken pieces in flour and brown in butter. Add remaining ingredients and cook until tender, adding water so that there are 2 cups at end of cooking. Make gravy by adding 3 tablespoons of hot liquid to yolk of an egg. Stir thoroughly, then return to rest of liquid and cook five minutes. Pour over steamed rice. Cut the beef into 1 inch cubes cover with water, season and boil until tender. 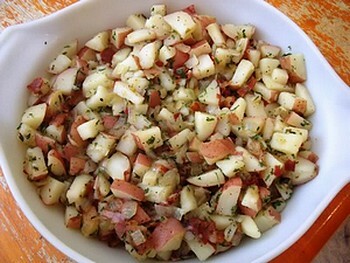 Peel potatoes, cut in ¼ inch slices and slice the onion. Into the hot broth drop layers of potatoes, onions, a sprinkling of parsley and dough squares alternately, ending with dough on top. Cover and boil for 20 minutes. Stir meat through pot pie. To 2 cups of flour add a little salt, 1 egg, beaten and enough milk to make a stiff dough. Roll out thin 1/8th of an inch on floured board and cut into 2 inch squares. Equally good with veal or pork. Mince the onion. Simmer in butter until soft. Add flour and simmer until brown. To this add vinegar, salt, pepper and meat stock and let come to a boil. Cut the meat in slices and serve hot, with the onion sauce. Veal should be about ½ inch thick and cut into serving portions. Season with salt and pepper. Dip pieces in bread crumbs, then into the beaten egg and again in the crumbs. Let stand in the refrigerator a while before cooking. Brown in hot fat on both sides, cover and simmer for 30 minutes. Sprinkle with lemon juice. Shred cabbage and put ½ of it in a greased casserole. Add ½ of the sliced potatoes and half of the hamburger a sprinkle of salt and pepper. Add remaining half in the same manner. Pour on the milk and bake in a moderate oven (350-f) for 2 hours. Sprinkle the pieces of chicken with salt and pepper and dredge in flour. Melt butter and fry chicken until a golden brown on all sides. Place the chicken in a casserole, pour the cream over it. Cover and bake in a moderate oven (350 degrees F.) for 2 hours. Serve with gravy made from the pan fryings left after frying the chicken. Mix all ingredients, form into two loaves. Pour some catsup over top of loaves. Bake at 350 until done. Mix the meat, rice, eggs and seasoning together. Cut tops off the peppers and soak in hot water for a couple of minutes. Scoop out seeds and fill with the meat mixture. Stand them in baking pan, pour the tomato soup over them and bake in slow oven (300 degrees F. for 1 hour. Wash squash and cut in halves, remove seeds. Put a tablespoon of molasses in each half, sprinkle with salt and a pinch of powdered sage (if the sausage does not contain sage). Fill the cavity with sausage and top with bread crumbs. Place the squash halves in a baking pan, add about an inch of water to the pan. Cover and bake in hot oven (400 degrees F.) for 40 minutes. Remove cover and brown. Cut spareribs into serving portions and place in the bottom of roasting pan. Add the sauerkraut and a little liquid. Cover and bake in moderate oven (350 dgrees F.) for 1½ hours. Make dumplings by combining flour, baking powder, milk and egg. Drop by spoonfuls on sauerkraut, cover tightly and bake for 20 minutes. Use 3 pigs feet or about 2 lbs. Scrape, wash and clean thoroughly. Place in stew pan with 1 chopped onion, ½ cup chopped celery and cover with cold water. Let it come to a boil, then reduce heat and simmer until meat is tender and comes easily from the bone. Pick meat from the bones, strain liquid, which should measure a scant 3 cups. (If less add water). Put meat and liquid into a bowl. Add 3 tblsp. strong cider vinegar, ¾ tsp. salt, black pepper and several thin slices of lemon. Chill overnight, remove surplus fat from the top. Turn out on a platter and serve with lemon slices and parsley. Put pork in large stew pan and cover with cold water, cook slowly for 1 hour. Add the sauerkraut making sure there is enough liquid in the pan to cover. Cook slowly for another hour. Season to taste. Serve with mashed or boiled potatoes. To make dressing beat eggs, add milk and pour over bread crumbs. Add the onion, seasoning and work in the butter mixing thoroughly. Spread the dressing over the meat and roll up carefully. Fasten with skewers or tie with string. Place in a greased pan and bake in medium hot oven (375 degrees F.) for 1½ hours. Slice to serve. * 2 lbs. smoked sausage meat, diced. Clean stomach well and soak in salt water. Combine all ingredients and mix well. Stuff the stomach with the mixture and sew up the opening. Simmer for 2 hours in a large kettle with water to cover. Remove to baking pan with hot fat, brown in hot oven (400-f) basting frequently. Slice with sharp knife. Sift together the dry ingredients and mix the dough with egg, which has been well beaten, the melted shortening and the milk. Drop batter by spoonfuls into the boiling liquor of the ham and apples. Cover tightly and cook for 15 minutes. Raisins may be added if desired. Place ham in large pot and cover with water. Cook slowly for a couple of hours (less if the ham is tenderized) keeping plenty of water on the ham. Clean and break-up the string beans, put them in with ham and cook for 25 minutes more. Add the potatoes, which have been pared and cut-up, and cook slowly until ready. Season to taste. Equal amount of lean and fat fresh pork, ground. To each pound of this mixture, add 1 teaspoon salt, 1/8 teaspoon pepper, pinch each of sage and thyme. Add one egg beaten, mold into cakes and fry until brown. Wonderful with pancakes or waffles. After seasoning the meat with salt and pepper, stew the meat for two hours. Then make dough with flour, baking powder, salt and the shortening. Mix into a pie-crust dough. Roll into a dozen circles 8 to 10 inches in diameter. Steam the potatoes, pared and sliced thin; add salt and pepper, 2 tablespoons of butter; the parsley and onions and then beat lightly the three eggs into the mixture. Put this mixture on the circles of dough after it has stood a little while. Fold half the circle of dough over like a half moon and press edges together tightly. Drop these into the pot with the meat and stew water. Cover tightly and cook for 30 minutes. Into a frying pan put a couple of tablespoons of fat skimmed from the stew before putting in the dough rolls, add to this 1 tablespoon of butter. In this brown small cubes of hard bread and stir in a half cup of milk. Pour this milk sauce over the Meat rolls when serving. To 1 cup of dried corn (ground in food chopper) pour on 2 cups of hot milk and let stand about an hour. Then add 2 beaten eggs, 1 cup milk, 1 tablespoon butter, 2 tablespoons sugar and salt to taste. Bake ½ hour in oven of 350 to 360 degrees F.
Heat the milk to boiling. Add butter and the cabbage. Cook seven minutes. Thicken with the flour, mixed with a little cold water. Boil sweet potatoes until tender. Slice in ¼ inch pieces. Butter baking dish and put a layer of sweet potatoes in bottom, then a layer of apples. Sprinkle with sugar, salt and mace, and dot with butter. Repeat until dish is filled, having the top layer of apples. Bake in moderate oven (350 degrees F.) for 50 minutes. Mash sweet potatoes very fine and add salt, sugar and melted butter. Shape into croquette rolls or patties and chill in the refrigerator for a half hour. Then roll in bread crumbs, dip in the egg white, slightly beaten, and in the crumbs again. Bake in a shallow, greased baking dish for 20 minutes, in hot oven (400 degrees F.). For a modern variation of this old recipe, place a marshmallow in the center of each with the potato mixture coating it completely. Dice the bacon and fry until crisp. Slice the onions and fry until soft. Cut the beans into small (1-inch) pieces and brown them slightly with the bacon and onions. Add the tomatoes, seasoning and boiling water. Cover and cook very slowly until beans are tender. Add water if necessary, so there will be a little sauce to serve with the beans. Cut large, solid, ripe tomatoes in ½ inch slices. Dredge thickly with flour. Fry quickly in 2 tablespoons of hot drippings or butter, browning well on both sides. Remove to serving platter, sprinkle with salt, pepper and brown sugar. Keep warm. Add 1 tablespoon of butter to the pan fryings and blend in a tablespoon of flour. Add the milk and cook, stirring constantly. It should be about the consistency of thick cream. Pour it over the tomatoes and serve. Boil parsnips in salted water. When soft, peel and remove the core then mash. Add shortening, bread crumbs, salt, pepper, sugar and 1 egg and the white of the other, beaten. Mix well and form into cakes. Beat the remaining egg yolk with a little milk added. Dip the cakes into the egg, roll in corn meal or bread crumbs and fry to a nice brown. Melt butter in double boiler or sauce pan. Add flour, seasoning and stir smooth. Slowly add the hot milk stirring constantly. When it thickens melt the grated cheese in the sauce. Into a buttered baking dish or casserole put layers of the sliced potatoes, onions and cheese sauce, repeating until all ingredients are used. Bake in a moderate oven (350 degrees F.) for 1 hour. Pare egg plant and cut in slices ½ inch thick. Soak slices in salt water for about an hour. Drain and wipe dry. Dip slices in beaten egg and roll in fine bread or cracker crumbs. Fry in hot fat (or deep fat) until well browned on both sides. Serve with catsup or tomato sauce. Cut off beet tops leaving 2 inches of the stems. Clean well, place in pot and cover with boiling water. Cook until tender, slip off the outer skins and dice. Strain and save 1 cup of the water in which beets were cooked. Add sugar, vinegar and butter. Thicken with 1 tablespoon of corn starch and cook to the consistency of cream. Add the diced beets, salt and pepper and heat. Into a greased baking dish or casserole place a layer of tomatoes, add half the cucumber and onion slices and half of the crumbs. Repeat with more tomatoes and remaining cucumbers, onions and crumbs. Top with tomatoes and sprinkle with cheese. Bake in moderate oven, (375 degrees F. 40 minutes. Mix up a paste with the potatoes and butter, add the parsley, salt and pepper, cream, onion and egg. Mold into croquettes, dip into the egg white, roll in corn meal. Fry in deep fat. Place 4 tablespoons bacon grease in pressure cooker, then chop fine 1 small onion in grease and brown onion to golden brown. Shred (1) 2½ lb. head of red cabbage. Mix ¼ cup vinegar with ¼ cup water and 2 tablespoons sugar. Then place cabbage in onion and grease. Pour mixture of vinegar and sugar on cabbage. Season with salt and pepper to taste and mix lightly. Quarter 1 large pared apple and place on top of cabbage. Cook 4 min. When using an ordinary pot the cooking time is 20 minutes. This makes 10 servings. Wash spinach thoroughly. Drain and cook with a little water in covered pot, over moderate heat for 8 to 10 minutes. Drain and chop the spinach. Add milk, the beaten eggs, 1½ cups of the bread crumbs, melted butter, salt and pepper then mix well. Sprinkle the remaining ½ cup bread crumbs and the chopped bacon, on the top. Bake in moderate oven (350 degrees F.) 35 minutes. Cook potatoes and peas in separate pans, in salted water until soft and almost free of water. Mix the peas and potatoes and add the milk. Bring to the boiling point then add the butter and flour which have been blended smooth and cook until thickened. Mix all ingredients together. Place in buttered casserole. Bake in slow oven 300 degrees F. for one hour. Cut up celery and cook in a little salt water until soft and almost dry. Make a dressing of the egg, flour, sugar, vinegar and water, bring to a boil and when it thickens add the sour cream. Pour this over the celery, heat and serve. Soak beans over night in cold water. Drain, add 1½ qts. of fresh water, the Onion and cook slowly until skins burst. Drain save the liquid. Mix molasses, seasoning and catsup with 1 cup of the liquid. Put half the salt pork or bacon in bottom of bean pot or baking dish, add the beans and top with remainder of pork or bacon. Pour molasses mixture over beans, add more liquid to cover. Bake covered for 5 hours in slow oven (300-f). Uncover for the last 30 minutes. Add water if necessary, while cooking. Shred cabbage rather finely. Put in sauce pan and sprinkle with salt. Cover pan and place over low heat and steam until tender. Beat the egg, add the vinegar, sugar and salt and pour over the steamed cabbage. Heat five minutes and serve at once. Soak beans overnight in cold water. Drain, add 2 quarts of fresh water and boil until tender. Pour beans in buttered casserole. Add minced pepper, onion, tomatoes and seasoning and mix. Put bacon or salt pork on top and bake, covered. Add water if necessary. Bake 2 hours at (325 degrees F.). Uncover for the last 20 minutes. 1 cup ground dried corn, add 1¼ cups milk (or part water); let stand ½ hour or longer, add ½ teaspoon salt, ½ teaspoon sugar, 1 teaspoon baking powder, ½ cup flour, 1 egg, well beaten, and fry to a golden brown. Beat the egg yolks and add the flour, 1 teaspoon salt and a little pepper. Add the corn and fold in the stiffly beaten egg whites. Drop small spoonfuls on greased griddle or frying pan. Do not cook too fast. Cut the kernels from two ears by standing each ear upright on a plate, carefully slice beneath the rows in a steady downward motion. With the back of the knife, scrape the cobs to extract the juice. Grate the kernels from the remaining 2 ears, cutting off the kernels at just half their depth and scraping off pulp on the cob. Put all the corn kernels, pulp and juice into a bowl. The mixture will resemble scrambled eggs. Beat the egg yolks in a large bowl until light. Beat in the flour, sugar, salt and pepper to taste. Stir in the corn. Beat the egg whites in a large bowl until stiff. Fold them into the corn mixture. Heat a heavy skillet or griddle over medium heat and grease it lightly with butter. Drop the batter by small spoonfuls onto the skillet and cook until golden. About 30 seconds each side. Transfer the cooked fritters to a lightly buttered serving platter and keep them warm in a low oven while cooking the remaining fritters. Chop potatoes fine, season with celery salt, salt and pepper to taste. Remove seeds and stem from pepper, wash drain and chop fine. Mix with potatoes. Put about 1 tablespoon of melted shortening in pan and when hot, add potatoes and cook slowly. When partly brown, fold into omelet shape in one side of pan. Fry until a rich brown. Sift together the flour, baking powder, salt and sugar. Combine the beaten egg yolks with water and mix until smooth. Fold in the stiffly-beaten egg whites and add the cherries. Drop by spoonfuls into hot fat (360 degreesF.) and cook 2 to 5 minutes or until browned. Drain on absorbent paper and serve with powdered sugar or fruit sauce. Other fruits or berries may be used. Cream the butter and sugar, add the eggs and beat thoroughly. Sift dry ingredients together and add the milk slowly. Fold in peaches, lemon juice and vanilla. Drop by teaspoonfuls into hot fat. Fry golden brown. Serve with whipped cream or sprinkle with powdered sugar. In mixer or blender, beat flour, milk, eggs, vanilla, salt, and nutmeg; set aside. Heat oven to 475 degrees. In cast iron skillet for 5 minutes, add 2 tablespoons butter; melt. Add sliced apples and fry 2 to 3 minutes. Pour mixture over apples. Bake at 475 degrees for 15 minutes. Reduce heat to 425 degrees for 8 to 10 minutes. Sprinkle with powdered sugar. Cut in wedges. Serve with syrup or jam and bacon. Put the yolks of 5 eggs in a bowl and beat until very light. Add the milk and flour gradually and mix into a smooth batter which is not too thick. Fold in the stiffly beaten egg whites. Drop large spoonfuls on a hot greased griddle. Serve hot sprinkled with sugar or spread with currant or other tart jelly or jam. Add egg yolks to the mashed potatoes and mix well. Add the flour and baking powder alternately with the milk until smooth. Fold in the stiffly beaten egg whites and drop spoonfuls on hot greased griddle or skillet. Finely chopped onion is sometimes sprinkled on the batter on griddle before turning. Serve hot with meat. Sift flour, corn meal, baking powder, soda and salt. Sift again. Beat eggs well, add the buttermilk and combine with the dry ingredients. Beat until smooth and add melted butter. Bake on hot griddle. The “dutch" housewife rubbed the griddle with the flat part of a raw turnip cut in half, to prevent sticking. Some used a little cloth bag filled with salt. Serve with brown sugar or syrup. Sift together in a bowl the flour, salt and baking powder. Beat the egg yolks and add the milk. Pour milk mixture slowly into the dry ingredients and beat to a smooth batter. Add the melted butter then fold in the stiffly beaten egg whites. Bake on hot griddle. Makes about 12 cakes. Moisten corn meal with a little cold water and stir into the salted boiling water. Cook over slow fire, stirring often, for 45 minutes. (Most of the corn meal sold today has been processed to cook much faster, so follow the directions.) Pour the hot corn meal into a greased loaf pan or glass baking dish. Let stand, uncovered, until cold and firm. Cut into slices, dip in flour and fry in hot fat until browned. Serve with syrup. Wonderful with sausage. Beat mashed potatoes, add melted shortening, beaten eggs and milk. Sift dry ingredients together and add to the liquid. Dough should be soft yet firm enough to roll. Separate dough into 2 parts and roll each out to thickness of ¾ inch. Cut with doughnut cutter and cook in deep fat (365 degrees F.) fry to golden brown. Drain on absorbent paper. Dust with powdered sugar or sugar and cinnamon mixture. At night break and soak yeast in lukewarm water for 20 minutes. Mix with flour to a thick batter. Cover, let rise in warm place overnight until doubled. In the morning cream together the shortening, sugar and salt. Add this to the risen sponge, with the beaten eggs and spice. Stir in as much flour as mixture will take up readily, making a rather soft dough. Mix well. Let rise until doubled in bulk. If desired, stir down and let rise again until nearly doubled. Turn onto floured board, pat or roll until ? inch thick and cut with doughnut cutter. Cover to prevent drying and let rise until doubled. Fry in deep hot fat about 375 degrees. If no thermometer is at hand, test temperature with 1 inch square of bread, which should brown in 1 minute. Beat the eggs, add cream and milk. Sift dry ingredients and combine with liquid, using just enough flour to make dough that can be rolled, but still remain soft. Mix well and let stand for 2 hours. Turn out on floured board and roll to ¼ in. thick. Cut into strips 6" × 1". Fry in deep fat (360-f) until brown on both sides. Drain on absorbent paper and dust with powdered sugar, if you wish. Cream together the butter and sugar. Add the eggs beating well. Sift in the cinnamon and enough flour to make a stiff dough. Roll out the dough very thin on a floured board to about 1/8 inch thick. Cut into rectangular pieces 3 inches by 5 inches. Make 5 cuts lengthwise in the dough ½ inch apart and 4½ inches long, so that the rectangle remains in one piece. Fry in hot deep fat (360 degrees F.) for 2 minutes or until they bob up to the top of the hot grease. When dropping them into the fryer, pick up the 1st, 3rd and 5th strips and pull them upward. Let the 2nd, 4th and 6th sag downward so that in frying they get all fahuudelt (tangled) or as the dutch say, all through each other. Dust with powdered sugar or dribble molasses over them and eat hot. Beat eggs and add sugar and milk. Sift half the flour, salt and baking powder together and add to milk and egg mixture. Beat the batter smooth and add only as much more flour as needed. Batter should be thin enough to run through a funnel. Drop from funnel into deep, hot fat (375-f). Spirals and endless intricate shapes can be made by swirling and criss-crossing while controlling the funnel spout with a finger. Serve hot with molasses, tart jelly, jam or sprinkle with powdered sugar. Mix above ingredients. Add: 1 c. oil 1 qt. buttermilk 2 tsp. vanilla Mix well. Butter muffin tins well and fill 3/4 full. Bake at 375 degrees for 20 minutes. Cream butter and sugar. Add fruit and egg, then milk and flour sifted with baking powder and salt. Bake in muffin tins. Bake at 375 degrees for 20 minutes. Sift the flour, baking powder and salt. Stir in the sugar and bran. Combine the beaten egg, milk and melted shortening. Add to the dry ingredients and mix quickly. Turn into greased muffin pans and bake in hot oven (425 degrees F.) 25 minutes. Raisins or chopped dried prunes may be added. Combine sugar, flour and soda. Cut in the shortening and blend well. Add the liquid and rub into coarse crumbs. Put crumbs loosely into the unbaked pie shell. Bake in moderate oven (375-f) for 40 minutes. This is a breakfast treat especially good for dunking in coffee. Sift flour, baking powder, salt and sugar. Combine the beaten egg yolks and milk and add to the flour mixture, stirring only until mixed. Add shortening, fold in the stiffly beaten egg whites. Turn into greased 9 inch square pan and bake in moderate oven (350-f) about 30 minutes. Cut into 3 inch squares. Dissolve yeast cake in ¼ cup of warm milk, add 2 tablespoons of flour and stand in warm place to rise. Cream butter and sugar, add salt and the eggs, beaten in one at a time. Add the sponge containing the yeast, the lukewarm cream and the sifted flour. Grease muffin pans and sift a little flour over them. Fill pans about ? full with the batter. Set in a warm place until dough rises to the top of the pans. Bake in hot oven (400-f) for 25 minutes. In a mixing bowl put warm mashed potatoes, shortening, sugar and salt. Beat to a cream and add 2 eggs, the yeast cake dissolved in cup of lukewarm water. Use about 2 cups of the flour to make a thin batter. Cover and let it raise over night. When well risen add 4 cups of flour to make as stiff a dough as can be stirred well with a mixing spoon. Roll out dough to ½ inch thickness on a floured board. Cut into squares about the size of a soda cracker. Bring each of the 4 corners, of each square, to the center and pinch together. Place a small piece of butter on top of each. Put on greased baking sheets about 2 inches apart and stand in warm place to rise until very light. Bake in hot oven (400-f) for 15 to 20 minutes. While still hot, brush with melted butter and dust with powdered sugar or sugar and cinnamon mixed. Break and soak yeast in water until soft. Scald and then cool milk. Cream together butter, sugar and salt. Add well beaten eggs, lemon and spice. Add lukewarm milk to yeast and mix with half the flour. Work in butter and sugar mixture and enough flour to knead into a smooth dough. Keep it as soft as can be handled readily. Let rise over night at about 80 degrees. As soon as dough is fully doubled in bulk, knead down and let rise again for an hour. Makes three dozen. Roll ? of the sweet dough into an oblong sheet, ¼ inch thick. Brush with butter and sprinkle with brown sugar and cinnamon. Roll up and cut off 1 inch slices. Place cut side down in greased pan. Brush tops with butter. Let rise until double. Sprinkle with brown sugar and cinnamon and chopped pecans or pour corn syrup in the bottom of the pan. Bake 20 mins. at 375 degrees F.
At night crumble and soak yeast 20 minutes in lukewarm water. Scald milk, add salt and let cool. Add yeast to lukewarm milk and mix enough flour to make a thick batter. Beat smooth. Cover and let rise in moderately warm place (78 degrees) over night or until light. In morning scald and cool milk. Cream butter, sugar and salt. Add beaten eggs. Mix sponge with lukewarm milk, then add butter mixture and enough flour to make soft dough. Beat hard or knead by hand. Let dough rise until doubled. When light turn on floured board and roll out gently until ½ inch thick. Place in buttered pans. Brush top with melted butter. Let rise until double. Sprinkle with sugar or cinnamon and bake in hot oven for 20 minutes. and floured 9x5 inch loaf pans. Bake at 350 degrees for one (1) hour. Especially good spread with cream cheese. loaves with a fork after baking and pour glaze over while hot. Beat the eggs until thick and creamy. Add sifted sugar and beat well. Add water and lemon juice and beat again. Sift the flour, add salt and baking powder and sift again. Combine dry ingredients with the egg mixture, a little at a time folding in gently. When well blended pour into an ungreased pan with center tube. Bake in moderate oven (350-f) for 50 minutes. Sift flour, corn meal, baking powder, soda, salt and sugar together. Combine eggs and sour milk (or buttermilk) and add to the flour mixture. Mix well and stir in the shortening. Bake in greased 8 × 8 × 2-inch pan, in moderately hot oven (375-f) 40 minutes. Blend butter, sugar, spices and salt. Beat egg yolks and add. Sift in baking powder and flour, then add the water and honey. Put fruit and nuts through food chopper and flour well. Follow Solomon’s advice for making good boys—1st clause of Proverbs, 23:14. Fold in stiffly beaten egg whites. Bake for 1 hour in 375-f oven. Cream together and boil until it forms a soft ball when dropped in water. Add vanilla and beat until cold. Spread between layers, over top and sides. Cream butter and sugar, well. Add bread crumbs and cinnamon. Blend well and sprinkle over cake dough. Bake in moderate oven (375-f) 40 to 50 minutes. Serve hot. Cream shortening and sugar. Add molasses and beaten eggs. Sift dry ingredients and add alternately with 1½ cups of sour milk. Mix the soda in the remaining milk and add with remainder of flour. Floured currants and raisins are added last. Bake in a loaf pan in a slow oven about one hour. Cream the sugar and shortening in a bowl. Add the molasses and pour the cup of boiling water over it. Mix well. Combine the flour, soda and spices, sift and add to the molasses mixture, beating well. Add the eggs one at a time and blend thoroughly. Next add the chopped nut meats. Pour into a well greased loaf pan and bake in moderate oven (350-f) for 40 minutes. Cream together butter, sugar and spices. Add apple sauce, flour and soda dissolved in a little warm water. Add the raisins (or currants). Beat thoroughly and pour into a loaf tin. Bake in moderate oven (350-f) for approximately 50 minutes. 1 cup pulverized sugar, piece of butter size of a walnut. Moisten with a little water and spread over cake. Rub butter and sugar to a light, white cream. Add egg yolks and beat until smooth. Sift flour, salt and baking powder and add, together with milk, a little at a time, beating well. Fold in chopped nuts and stiffly beaten egg whites. Pour into 2 nine inch cake pans or 1 loaf pan. Bake in medium oven (350-f) for 30 minutes for layer cake or 1 hour for loaf cake. Use hickory nuts, black walnuts or shell barks. Beat egg yolks until thick and foamy. Beat egg whites stiff and combine with egg yolks. Gradually add the powdered sugar and mix lightly. Sift flour and add to the egg mixture together with the anise seed. Drop from teaspoon on greased cookie sheet, spacing about 1 inch apart. Chill in refrigerator over night. Bake in slow oven (300-f) for about 12 minutes. Cream shortening and sugar, add the eggs and beat until light and fluffy. Sift flour add salt and cinnamon and sift again. Dissolve the soda in the hot water and add to the creamed mixture. Add half of the sifted dry ingredients mixing well. Fold in the chopped fruit and nuts and the remaining flour mixture. Stir until thoroughly blended. Drop teaspoonfuls on greased cookie sheets, about 2 inches apart and bake in moderate oven (350-f) for 15 minutes. Cream the butter and sugar. Beat in the eggs 1 at a time and add cinnamon. Work in enough flour to make a soft dough. Form into small balls. Place several in a hot waffle iron, suitably spaced, press down top and bake. This is an old recipe which the “dutch" brought over from Germany. Blend shortening, sugar and molasses. Add beaten egg. Sift dry ingredients and combine. Mix well, roll out and cut in fancy shapes. Bake at 350 degrees for 10 minutes. When cool decorate with boiled icing. Grind raisins and peanuts. Sift together flour, baking powder, nutmeg, cinnamon, salt. Cut in lard, add sugar, oatmeal, raisins and peanuts and mix well again. Dissolve soda in sour milk and add molasses and beaten eggs. Chill one hour. Using your hand, roll the dough into balls the size of a walnut and press slightly flat. Beat two eggs and paint the top of the cookie with egg. Bake at 375 degrees until golden brown. Cream shortening with white and brown sugar. Add 2 eggs and work in the sifted dry ingredients. Then add the chopped blanched almonds. Shape dough into long rolls. Roll in wax paper and store in cold place for 12 hours. Slice thin and bake in hot oven. Cream shortening and sugar. Add eggs and milk with soda. Mix together and add baking powder. Gradually add flour and stir well. Stir in chocolate chips or butterscotch chips. Place on a greased cookie sheet about 1 teaspoon of dough. Bake at 400 degrees until the edge is lightly brown. Work butter and part of the sugar together, then the remainder of the sugar and the eggs should be mixed in. Use flour enough to make very stiff. Roll thin, cut out in small squares, wet top with two eggs beaten, sprinkle with sugar, cinnamon and chopped almonds. Bake in moderate oven, 10 minutes. Beat egg whites until stiff and dry. Mix flour and sugar and fold in stiffly beaten egg whites. Add walnuts and bake in moderate oven, 375 degrees. Cream butter and sugar and add the beaten eggs. Dissolve soda in the hot water and add to the creamed mixture. Sift flour, salt and spices twice and add half of it to mixture and mix thoroughly. Combine chopped raisins and nuts with the other half and add to the dough. Mix thoroughly and drop by teaspoonfuls onto greased baking sheets spaced a couple of inches apart. Bake in moderate oven (350-f) for 12 to 15 minutes. Sift the flour, cinnamon, nutmeg, cloves and cream of tartar. Mix the sugar and beaten eggs thoroughly. Combine with the flour mixture, add citron and the almonds. Roll out on floured board, ¼ inch thick. Place on a greased cookie sheet and bake in moderate oven (350-f) for 15 minutes. Cut into squares or diamonds while still warm. Ice thinly with plain white or lemon frosting. This is an old recipe for an old time Christmas favorite. Cream butter until it resembles whipped cream and slowly add the sugar, beating well. Add flour gradually and blend thoroughly. Wrap in waxed paper and chill for several hours. Knead dough slightly on floured board, form into a smooth ball. Roll to about ? inch thick and cut to desired shapes. Place on ungreased cookie sheets and bake in moderate oven (350-f) about 12 minutes. When cold decorate with butter icing, candied fruit, etc. Rub paste until smooth, gradually work in the sugar until well mixed. Add a pinch of salt and beat in one egg white at a time, mixing thoroughly. Let stand for 20 minutes. Drop teaspoonfuls on lightly buttered baking sheet. Bake in slow oven (300-f) for 25 or 30 minutes until surface is dry. Keep in cool place overnight. Beat egg whites lightly, add sugar, then nut kernels, lastly the flour. Drop on greased tins and bake in moderate oven. 350 degrees. Pour melted butter over sugar in a bowl and beat until smooth and creamy. Add the eggs, beating one at a time, into the mixture. Sift the baking soda through the flour add the salt and add to the cake mixture. Stand the dough in a cold place for an hour. Roll out on floured board, quite thin. Cut into small rounds or other shapes. Sprinkle with sugar and bake in hot oven (400-f) for 10 minutes. Cream together shortening, brown sugar, spices and salt. Add the egg, mix thoroughly. Add molasses and blend. Sift together twice the flour, soda, baking powder and add to the molasses mixture. Stir well and chill. Roll out a fourth of the dough at a time, on floured board to a little more than 1/8 inch thick. Cut with gingerbread man cutters or other shapes. Bake on greased cookie sheets in moderately hot (375-f) oven, 8 to 10 minutes. Cool before decorating. Beat eggs well, gradually add powdered sugar, lemon juice and grated rind. Sift flour and add salt, soda and spices. Sift again and add to egg and sugar mixture. Beat to form smooth, medium-soft dough. Chill in refrigerator for several hours. Roll out on floured board, into long finger-shaped sticks. Cut into small marble sized pieces and bake on greased baking sheets in hot oven (425-f) until they turn a light, golden brown. Cream the butter and sugar together until smooth. Add the cream, molasses, cinnamon, ginger and cloves and blend smooth. Work in the flour gradually. Roll out as thin as possible on floured board. Cut into various shapes with cookie cutters. Bake on greased cookie sheets in moderate oven (350-f) for about 12 minutes. Decorate using a pastry tube and icing made from egg-white and confectioners sugar. Place all ingredients in a bowl and beat well with a rotary egg beater. Chill and pour into an unbaked pie shell. Bake in hot oven (450-f) for 10 minutes. Reduce heat to moderately slow oven (325-f). When surface of pie filling turns light brown, test by inserting a silver knife. If it comes out clean the pie is finished baking. Mix 2 tablespoons of flour with ½ cup sugar and a pinch of salt. Beat 2 egg yolks. Add the juice and grated rind of 1 lemon. Then add flour and sugar continuing to beat. Stir in 1½ cups milk and lastly fold in 2 egg whites beaten stiff, but not dry. Pour into unbaked pie shell. Bake in hot oven, 425 degrees for 15 minutes. Reduce heat to moderate 350 degrees and bake 15 minutes more. Mix flour and sugar and pitted cherries in a bowl. Fill unbaked pie crust with the cherries. Put on a top pie crust, vented and bake in a hot oven for 10 minutes. Reduce to moderate and bake for 20 minutes more. Mix or “crumb" the above ingredients together with the hands to form small lumps or rivels. Strew the rivels into a prepared pastry shell and bake in a hot oven (400-f) for 30 minutes. Some spread 2 tblsps. of molasses over it before baking. Cook this and when cool, add the whites of three eggs stiffly beaten. Lift the upper crust of the pie and pour in this cream filling. Replace the crust and sift with powdered sugar. When making a fruit pie, put lower crust in the oven 5 minutes and bake while you are rolling out the top crust. Then put in filling and put on the top crust. The under crust will not be soggy. Blend butter and sugar, add egg and beat well. Add milk and the sifted dry ingredients a little at a time. Spread topping over mixture in the pie shell. Bake in moderate oven (350-f) for 40 minutes. Pare apples and cut into thick slices. Mix half the sugar with the cinnamon and sprinkle over apples. Put into unbaked pastry shell. Blend the flour, the remaining sugar and the butter and work into small crumbs, with your fingers. Sprinkle the crumbs over the apples. Bake in hot oven (425-f) for 10 minutes then reduce to moderate (350-f) and bake for 35 minutes more. Serve with cheese. Make crust for 2 pies and line medium size pie plates. Sprinkle the walnuts over the crusts and then mix in the filling. The eggs must be well beaten before adding the sugar gradually. Then fold in flour, corn syrup and 1½ cups of water. Bake in very hot oven for three minutes and then reduce to medium for 30 or 40 minutes. Combine cottage cheese, sugar, flour, salt, lemon rind and spices. Add beaten egg yolks and mix thoroughly. Add milk gradually and stir smooth. Fold in beaten egg whites and pour into 9 inch, pastry lined pan. Bake in moderate (350-f) oven, 1 hour. Combine apple butter, beaten eggs, sugar, cornstarch and cinnamon and mix well. Add the milk gradually to the mixture and blend well. Pour into unbaked pie shell. Top with “lattice" made from ½ inch wide strips of crust. Bake at 350-f, 35 minutes. Fill an unbaked pie shell with currants and red raspberries. Sugar generously. Add the top crust and bake for 30 minutes. This is unusual and very delicious. Cover Schnitz with water and soak over night. Add orange rind and juice and more water if necessary. Boil until soft, then put through colander and add sugar and cinnamon. Pour into pastry lined shell, dot with butter, cover with top crust or lattice strips. Bake in hot oven (450-f) for 10 minutes. Reduce to 350-f bake 30 minutes. Cut rhubarb into small pieces and arrange in an unbaked pie shell. Combine the sugar and flour, add egg yolks and lemon juice. Stir into a smooth paste. Pour this mixture over rhubarb. Cover with meringue made from the egg white. Bake in a hot oven (425-f) for 10 minutes, then reduce heat to (325-f) and bake for 30 minutes. 2 unbaked 8" pie crusts Mix crumb ingredients together until crumbs are formed. In separate bowl, mix syrup ingredients together. Pour 1/2 of syrup into each pie shell, then top each with crumbs, using 1/2 on each. Bake at 400 degrees for 10 minutes. Reduce heat to 350 degrees and bake for 50 more minutes. Cool completely before cutting. Cream sugar and butter together; add eggs and mix. Blend flour, salt and baking powder together and add to mixture. Mix soda with milk and vanilla; mix all together. Add apple slices and pour batter into a buttered baking dish. In a separate bowl, combine brown sugar, flour, cinnamon and butter, mixing until crumb texture; sprinkle over apple batter. Bake at 375 degrees for 35 to 40 minutes. Serve hot with rich milk, Half and Half or a scoop of ice cream. Makes 4 generous servings. Into this break 1 egg. Mix until crumbly. Put over apples (peaches) bake in moderate oven (350-f) till crust is brown. Serve with milk, whipped cream or ice cream. Mix flour, baking powder and salt and sift twice. Cream butter until soft; add sugar gradually, beating until light. Beat in the egg and flavoring. Add flour mixing alternately with the milk, beating smooth after each addition. Turn into a buttered square tin (8 × 8 × 2 inches). Bake in moderate oven (350-f) for about 40 minutes. Serve with butterscotch or orange sauce. It’s delicious covered with crushed berries or other fruits. Line buttered baking dish with slices of plain stale cake or bread. Fill with sweetened rhubarb. Cover and bake in moderately slow oven (325-f) for 30 minutes. Make a meringue by beating egg whites stiff and adding 4 tblsp. sugar. Remove pudding from oven, cover with meringue and brown in oven. Cream together the butter and sugar and add the egg then beat well. Sift the flour and baking powder and add alternately with the milk. Blend well, flour the cherries and stir in. Pour batter into a baking dish and bake in moderate oven (350-f) for 30 mins. Serve with plain or whipped cream. Pare and slice apples and arrange in a well greased shallow baking dish. Sprinkle with cinnamon, drizzle over molasses and dot with butter. Cover with biscuit dough which has been rolled to about ½ inch thickness. Cut gashes in dough to allow steam to escape. Bake in moderate oven about 375 degrees for 30 minutes. Serve hot, cutting out squares of the biscuit to use as a base for the fruit mixture. Serve with cream flavored with nutmeg. Prepare biscuit dough, roll ¼ inch thick and cut into squares. Pare and core apples and place one in center of each square. Fill each with a portion of the seasonings, sugar, raisins and dot with butter. Bring corners of the dough to the top of the apples and seal by pricking with a fork. Bake at 375 degrees for 30 minutes. Serve with cream or milk. Combine ingredients except egg whites in the order listed and mix well after each addition. Pour into baking dish or custard cups. Bake in a slow oven (325-f) until mixture thickens and browns. Beat the egg whites, adding 2 tablespoons of sugar, until stiff, spread on top of custard and brown lightly. Make a syrup of the sugar with the butter and 2 cups hot water. Add the peaches. Let this come to a boil. Make dumplings by mixing flour and baking powder and salt into a fairly stiff batter with milk or cream. Drop large spoonfuls of this batter into the boiling syrup and peaches. Cover and cook for 20 minutes. Serve while hot. Wash and seed cherries. Drop the apricots into boiling water for a few seconds, remove skins and seeds. Cut into quarters. Wash the berries. Mix the fruit and sugar together and cook quickly, until fruits are clear and tender. Seal in hot jars. Skin and cut rhubarb into ½ inch pieces. Add water and sugar, the orange juice and grated peel. Cook all together, stirring frequently to prevent scorching, for 30 minutes, or until clear. Put in sterile jelly glasses and seal. Clean and scrape carrots, cook until soft, then mash. Add sugar, juice of 2 lemons and the grated rind of 1 lemon. Cook 20 minutes, stirring frequently. Add the chopped nuts, pour into hot, sterile jars and seal. Use tart unpeeled apples and firm ripe peaches, cut into small pieces. Combine with lemon juice and sugar. Cook slowly until the apple is transparent (about 20 minutes). Pour into sterilized glasses, seal. Makes 7 6-oz. glasses. Wash and pick over gooseberries. Combine with sugar, vinegar, spices and cook slowly until mixture becomes rather thick. Pour into sterilized glasses and seal. 5 pints. Cut oranges into quarters and remove seeds. Grind cranberries and oranges, fruit and rind in food chopper. Add the hot water and bring to a boil. Cook quickly until fruit is soft. Add sugar and raisins. Cook over moderate heat, stirring often, until thickened. Add chopped walnuts or blanched almonds. Boil the cider until reduced to 1 quart. Pare the apples and slice thin. Put the apples into the cider and cook very slowly, stirring frequently, until it begins to thicken. Add sugar, syrup and cinnamon and continue to cook until thick enough to spread when cool. Seal in sterilized jars. Makes 5 to 6 pints. Pare the cantaloupe, remove seeds and cut into strips, 1 × 2 inch or squares. Dissolve the alum in the water and bring to a boil. Add the cantaloupe and cook for 15 minutes. Drain well. Combine vinegar, sugar and spices. Add the cantaloupe and simmer slowly until fruit is transparent (about 45 minutes). Place in hot sterilized jars and seal. Pare and core the pears. Dice or cut into thin slices. Add water and cook until tender. Add the sugar, ginger, the lemon juice and grated rind. Simmer mixture until thick and pears are transparent. Pour into sterilized jars and seal. Makes 5 pints. Boil beets until tender. Remove skins. Tie spices in cheesecloth. Heat vinegar, water, sugar and spices to boiling point. Add beets and boil 5 minutes. Pack in sterile jars and fill with hot liquid. Seal. Clean and cook whole green beans. Place them in a sterile pint jar. Boil the water, vinegar, sugar and 1/8 tsp. salt. Pour over the beans and seal jar. Put each kind of vegetable into a separate bowl and sprinkle a small amount of salt over each. Let stand 4 hours. Press juice from each vegetable and combine. Mix the dry ingredients and rub into a paste by using a small amount of vinegar. Then add all the vinegar and heat to boiling. Put in the vegetables and cook slowly for 20 minutes. Pack in sterile jars and seal. Cover jars with boiling water and simmer for 15 minutes. Makes 2½ quarts. Did you like these Amish recipes? Would you like some more? 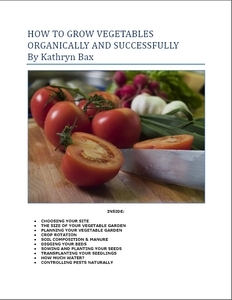 If you would like the rest of the recipes you can buy the book here. 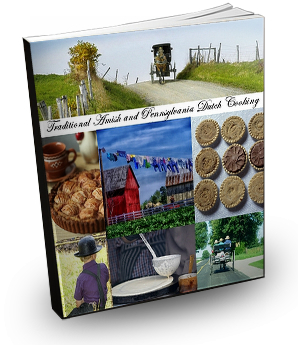 For just $4.99 (American Dollars) you can access more than a 200 authentic Amish recipes. You will be able to download the Amish recipes as an e-book in .pdf format for a quick download from a 3rd party provider and secure network. You can Add your own Favorite Amish Recipes! We have lots of pages where you can contribute to throughout this homesteading website. We love hearing from our readers, and hope you will be one of those we hear from too. Look around our homesteading website. If you have favorite Amish recipes of your own, please send it in! All you need to do is type and we will do the rest. Thanks for the wonderful memories you brought back of Amish country in Ontario, "home" to me!